Hydrocarbons from the Earth make up the oil and gas that heat our homes and fuel our cars. The study of the various phases of molecules formed from carbon and hydrogen under high pressures and temperatures, like those found in the Earth's interior, helps scientists understand the chemical processes occurring deep within planets, including Earth. 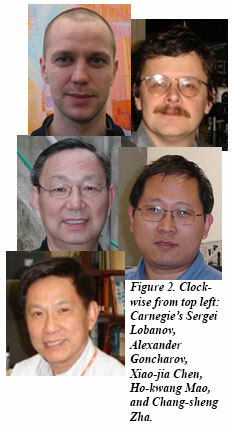 New research from a team including Carnegie's Sergei Lobanov, Alexander Goncharov, Chang-Shang Zha, Ho-Kwang Mao, and Xiao-jia Chen, along with Pei-Nan Chen from Massachusetts Institute of Technology, and Konstantin Litasov from the Russian Academy of Sciences hones in on the hydrocarbon methane (CH4), which is one of the most abundant molecules in the universe. Despite its ubiquity, methane’s behavior under the conditions found in planetary interiors is poorly understood due to contradictory information from various modeling studies. Knowledge of physics and chemistry of volatiles inside planets is based mainly on observations of the fluxes at their surfaces. High-pressure, high-temperature experiments, which simulate conditions deep inside planets and provide detailed information about the physical state, chemical reactivity, and properties of the planetary materials, remain a big challenge for us. For example, methane’s melting behavior is known only below 70,000 times normal atmospheric pressure (7 GPa). The ability to observe it under much more extreme conditions is fundamental information for planetary models. Moreover, its reactivity under extreme conditions also needs to be understood. Previous studies indicated little information about methane’s chemical reactivity under pressure and temperature conditions similar to those found in the deep Earth. This led to the assumption that methane is the main hydrocarbon phase of carbon, oxygen, and hydrogen-containing fluid in some parts of the Earth’s mantle. But the team’s work shows that it is necessary to question this assumption. Using high-pressure experimental techniques, the team was able to examine methane's phases and reactivity under a range of temperatures and pressures mimicking environments found beneath Earth's surface. At pressures reaching 790,000 times normal atmospheric pressure (80 GPa), methane’s melting temperature is still below 1,900 degrees Fahrenheit. This suggests that methane is not a solid under any conditions met deep within most planets. What’s more, its melting point is even lower than melting temperatures of water (H2O) and ammonia (NH3), other very important components in the interiors of giant planets. As the temperature increases above about 1,700 degrees Fahrenheit, methane becomes more chemically reactive. First, it partly disassociates into elemental carbon and hydrogen. Then, with further temperature increases, light hydrocarbon molecules start to form. Pressure also affects the composition of the carbon-hydrogen system, with heavy hydrocarbons becoming apparent at pressures above 250,000 times atmospheric pressure (25 GPa), indicating that under deep mantle conditions the environment is likely methane poor. These findings have implications both for Earth's deep chemistry and for the geochemistry of icy gas giant planets such as Uranus and Neptune. The team argues that this reactivity may play a role in the formation of ultradeep diamonds deep within the mantle. 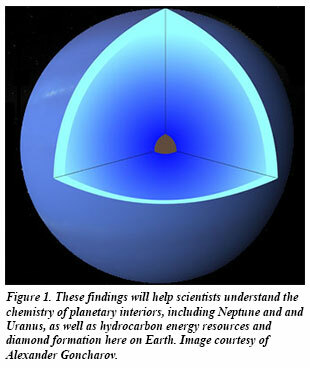 They assert that their findings should be taken into account in future models of the interiors of Neptune and Uranus, which are believed to have mantles consisting of a mixture of methane, water, and ammonia components [S. Lobanov et al., Nature Comm. 4, 2446 (2013)].